$1575.50 The price in Kiev! Signals "Go" only If refrigerant is 98% pure. "Go" and "No Go" lights clearly show If refrigerant is pure enough to be recovered or charged. Dual power source gives you service flexibility. • Hydrocarbon alarm protects the user by signalling If potentially dangerous butane, propane, etc., is present in the refrigerant. • Displays percent of air in the A/C system or tank. 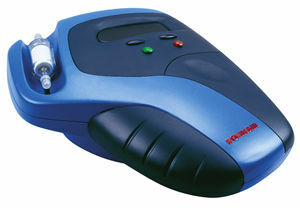 • Fast and Accurate - Displays test results in less than a minute and passes the refrigerant only If it's 98% pure. To assure consistent, rapid results, the units are not pressure/temperature dependent. • Reliable Technology - The instruments use dependable infrared technology developed by Neutronics, Inc., to determine If the refrigerant is an acceptable type and is pure enough to be used. • Unique Case Design - Puts all the components up front where you can see them at a glance, including the filter. Contoured case can be held in either hand and rubber feet protect the vehicle's finish.